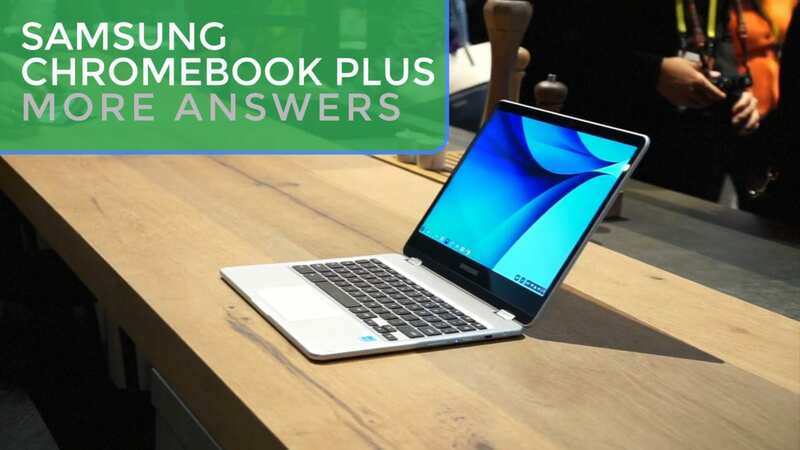 In our final hands-on time with the Samsung Chromebook Plus at CES, we wanted to address some of the questions we’ve already seen lingering on social media. As you can see in the video, this thing is very, very attractive and sleek. The build, though light and thin, feels quality and sturdy in the hand. As we’ve stated before, no backlighting is present in the keyboard and the all-aluminum chassis isn’t exactly weighted with laptop mode as it’s only position. One-finger lid openings aren’t going to happen here. Instead, we’re met with a device that feels just as at-home in tablet mode as it does in laptop or tent mode. the 3:2 screen is very bright, standing toe-to-toe with my Google Pixel and retaining inky blacks from every possible angle. When being used as a tablet, portrait and landscape orientations work well due to that screen ratio as well. The device’s thin and light design also play into this experience, again making the table feel very comfortable as a tablet. The pen has a few tricks up its sleeve as well, giving users the ability to lay their palms against the screen when writing, drawing or doodling. With the tablet in one hand and the pen in the other, this makes for a substantially better and more natural writing experience. Additionally, the pen does support multiple levels of pressure, giving pens, pencils, and markers differing stroke styles depending on your amount of force. Granted, it still feels like some work will need to be done to really get this writing experience fully ironed out, and Samsung/Google have over a month to really clean that up a bit. The pen input was a tad laggy from time to time as well, but we have to remember this is pre-production software we are working with. Another cool thing was the fact that this review unit was on the Stable Channel of Chrome OS, not Beta as we saw on the showroom floor. There is a chance that Chrome OS 56 on the units from the day before helped in the overall responsiveness on the Chromebook Plus. Either way, I’d say performance will be a bit better than what we are seeing right now out of the ARM model. Android apps fired up just fine and their inclusion even on this build of Chrome OS 55 shows us that any worries of this device having Android Apps at launch can be quelled. Overall, this Chromebook feels fast enough for daily, routine tasks. Web browsing, video and game consumption will be no issue here. With a few tasks running, apps open, and additional browsing, I could see some slow down, but it is a much-improved experience over older ARM chips. Web browsing, especially, felt very smooth and lagged very little. In the video, you can see some stutters, but it was also trying to install some Android apps at the same time, and that is pretty resource-intensive. For the most part, the speed of this device won’t be an issue for most folks. The Samsung Chromebook Plus is shaping up to be a very, very good Chromebook with some stiff competition. Its sibling, the Chromebook Pro, will be everything it is, only faster. Between it and the ASUS Flip C302, the competition in this segment will be very, very tough for the next few months for sure!